BROCKTON, Mass. – For the first 16 minutes of the game, the 13th-seeded Attleboro Bombarders went punch for punch with the third-seeded Brockton Boxers. 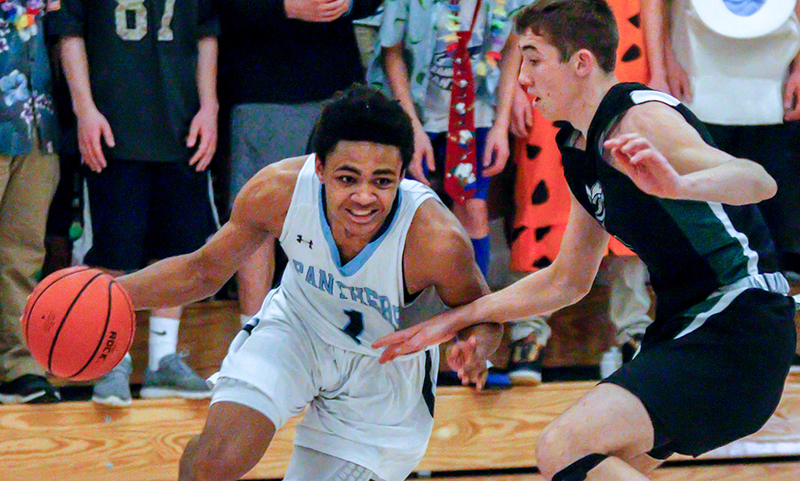 The Boxers amped up their defensive pressure, leading to turnovers and transition baskets and a 71-48 win in the opening round of the D1 South tournament. Attleboro trailed by as much as five but held a 9-8 lead at the midway point of the first, and used a late three to knot the game 15-15 at the end of one. 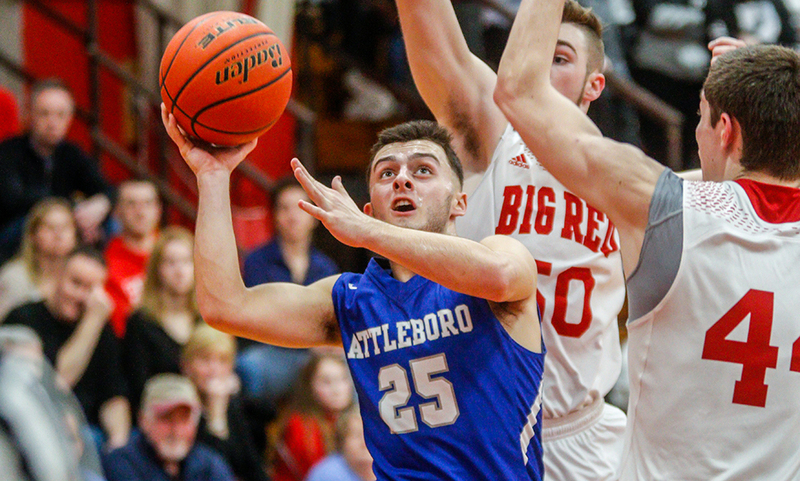 Sophomore Bryant Ciccio (13 points) scored six straight for Attleboro early in the second quarter, each bucket erasing a deficit to tie the game. A banked three from junior Mason Houle gave the Bombardiers a 24-23 edge, and two free throws from senior Nate Douglas (eight points) put Big Blue back in front 26-25 at the midway point. But late in the first half, the Boxers switched their defense up to apply a halfcourt trap. From that point, Attleboro scored just two points over the final four minutes, a bucket down low off the hands of sophomore Qualeem Charles (eight points, nine rebounds). Although trailing 32-28 at half, the Bombardiers seemed to be in a good spot, shooting nearly 50% from the floor despite missing some transition layups. “I just said to Coach Houle that I thought [Attleboro] controlled the game in the first half,” said Brockton head coach Bob Boen. “We were playing at their pace, we were doing what they wanted to do. I thought we were lucky to be ahead by four the way the first half went. I just decided we couldn’t play that way any longer, we had to get out and start pressing and pressuring in the half court. Unfortunately for Attleboro, it was the Boxers who dominated the second half. The halfcourt trap continued to bother Attleboro, who had more turnovers (seven) than field goals made (five) in the third quarter. Brockton’s active pressure led to easy transition buckets. Kevin Velazquez hit an early triple to cut the deficit to three, and Douglas drained one from deep to get the Bombardiers within six with five minutes left in the third. But Attleboro couldn’t find consistency in its offense due to the trap and Brockton rattled off eight straight points over the next two and a half minutes. Charles snapped the run with a putback of his own miss to get it back to 10, but Brockton created plenty of separation with a 9-3 run to finish the quarter, taking a 57-41 lead into the final quarter. It was more of the same in the fourth for Attleboro. The Bombardiers only managed seven points in the final quarter and didn’t score until two minutes left in the game. Ciccio hit two free throws, Lorenzo Wilson scored in the paint and Jornell Abadia drained a three. Attleboro boys basketball finishes the season 13-10. NORTH ATTLEBORO, Mass. – Six of the last seven contests between rivals Attleboro and North Attleboro have been decided by 10 points or less, and the Rocketeers have walked away victorious in all of them. Attleboro was ready to buck the trend. After being limited to 18 points in the first half, the Bombardiers made the necessary adjustments to get the offense in gear and picked up a 60-38 win over Big Red. It marked Big Blue’s first victory over their neighbor since January 2014. The Bombardiers relied upon improved rebounding (a 22-11 advantage in the second half), transition offense, and improved three-point shooting (six triples in the second compared to one in the first half) to turn a two-point deficit at halftime into an eight-point lead entering the fourth and a 22-point win. And the biggest reason for a lot of that was Attleboro’s Qualeem Charles (17 points). The 6’5” sophomore hauled in 10 of his 14 rebounds in the second half, which help set up the transition game. And on offense, Charles demanded the attention of North’s defense, which helped open things up on the perimeter. “I think Mark [Houle] did a great job at half, they adjusted to our fronting and double teaming of Charles,” said North Attleboro head coach Sean Mulkerrins. “To his kids’ credit, [Kevin] Velazquez and a couple other guys hit some open threes in the weak side corner. It was a little frustrating because we know its the read and we know its the counter to our counter, so maybe we just need to recognize it a step sooner on the skip pass. A triple from sophomore Bryant Ciccio (nine points, four rebounds) helped tie the game, 23-23, with under five minutes left in the third quarter. From there, the Bombardiers rattled off a 12-2 run to seize control of the game. 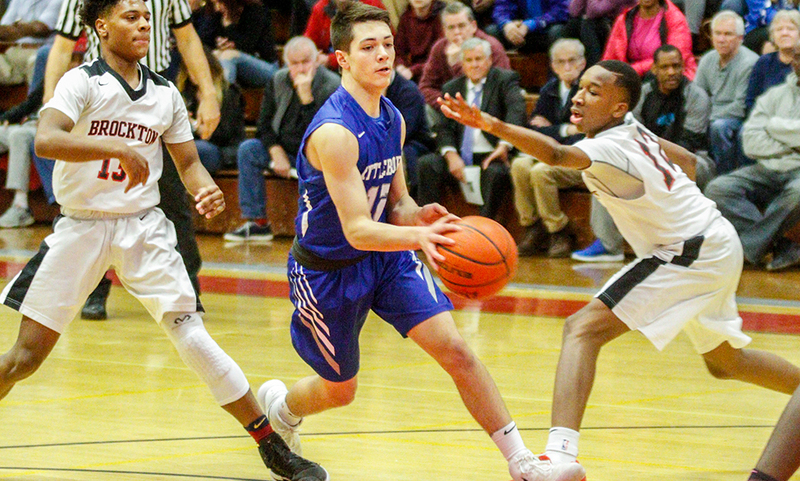 Nate Douglas (10 points, eight rebounds) went baseline for two, Ciccio hit a pair of free throws, Charles converted a putback and Mason Houle and Tim Callahan each hit a three-pointer to stretch Attleboro’s lead to two. A putback at the buzzer from North’s Matt Seavey (eight points, three rebounds) cut the deficit to single digits heading into the fourth quarter, 35-27. That’s when things clicked for Attleboro. Charles scored down low on a feed from Ciccio, and then Attleboro took advantage of North bringing weak side help on the big man. Douglas found Velazquez (14 points, three assists) on skip passes into the weak side corner for back-to-back three-pointers. Then the Bombardiers got out in transition with Velazquez threading the needle with a long bounce pass for an easy two for Jason Weir. “We were just going too fast so we just slowed it down on offense,” Houle said. “We were trying to attack the rim and everything was clogged. They were switching on defense so our motion offense really wasn’t doing anything. So we went to some of our quick hitter stuff. North’s Derek Shanks (nine points, six rebounds) had six consecutive points for the hosts but Attleboro had an answer each time. Ciccio sandwiched a pair of buckets around another triple from Velazquez in the weak side corner to give the Bombardiers a 52-36 lead with 3:40 to play. Charles scored down low on two consecutive possessions while Douglas put an exclamation point on the win with a breakaway dunk. North Attleboro raced out to a 6-0 lead after hitting its first three shots of the game but Attleboro closed the game with a 6-2 run over the final six minutes. Shanks tied the game, 12-12, in the second quarter with a pair of free throws, Josh Montague (eight points) hit a triple, Jake Petersen (eight points, four rebounds) converted a putback and Nate Gonsalves hit a three late to give North a 20-18 lead at halftime. Attleboro boys basketball (12-9 overall) will close out its regular season when it hosts Durfee on Wednesday night at 6:30. Attleboro (8-11) concludes its season when it travels to rival Bishop Feehan on the same night at the same time. ATTLEBORO, Mass. – Attleboro used its defense to get back into the game, but Foxboro used its defense to slam the door shut on the Bombardiers’ comeback. Trailing 58-52 with just over two minutes left in the game, Attleboro applied a full court pressure. The result was back-to-back steals from senior Nathan Douglas (12 points), the first Douglas scored on himself, the second turning into a layup from Elvin Sam. After Foxboro called timeout, Attleboro’s defense once again came up with a big play. Sam and junior Mason Houle jumped onto a loose ball, forcing a jump ball and giving possession to the hosts, down two, with a minute to go. But before Attleboro could set its play in motion, Foxboro senior Teddy Maher came up with a huge steal in a one-on-one situation. The Warriors used nearly the entire play clock before sophomore Brandon Borde (10 points, four rebounds) drove through traffic converted at the rim for a 60-56 lead with 22 seconds to play. The Bombardiers called timeout and executed right away as sophomore Qualeem Charles (career-high 28 points, 12 rebounds) quickly scored down low to get the deficit back to two with 12 seconds to go. Foxboro senior Joe Morrison (19 points) got the inbounds, was fouled, and iced the game with a pair of free throws, giving the Warriors a hard-fought 62-58 win over Attleboro in a very entertaining contest. “I thought we showed incredible poise,” said Foxboro head coach Jon Gibbs. “They threw that press on us and we weren’t really ready for it, and they got two quick steals. The momentum was completely in Attleboro’s favor…we’re on the road, the crowd is getting louder. It would have been really easy for us to fold but Teddy made a senior play. Teddy’s a phenomenal defender, he gives us a lot of intangibles, he gives a lot of things that don’t really show up in the box score but that’s what seniors do this time of year. They make winning plays. It was the second time Attleboro rallied in the second half, only for Foxboro to regain its footing late. The Warriors led by 10 (36-26) at halftime, but the Bombardiers executed their game plan nearly flawlessly early in the third to get back into it. Houle (four points, six assists) drove to the basket for two, Dom Victor hit back-to-back shots in the paint, Charles converted a pair of putbacks and then completed a traditional three-point play after a feed from Houle, giving Attleboro a 39-38 lead on the back of a 13-2 run over the first four minutes of the third. 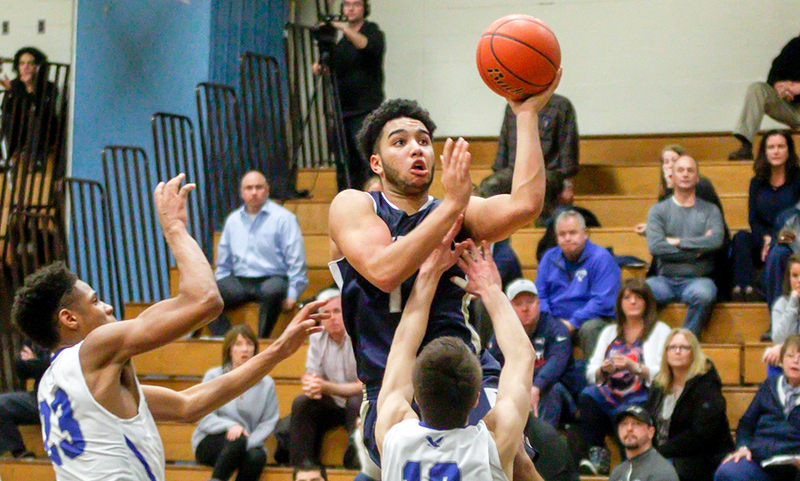 Foxboro regained the lead when senior Matt Rongione (14 points) knocked down his fourth three-pointer of the game and Maher converted a layup after an Attleboro turnover. But the Bombardiers went to work down low again, with Charles hitting two free throws after being fouled in the paint, and Victor again converting close to the basket. Morrison took over for the final 90 seconds of the third. He came up with a steal and went the distance for a layup. After a steal fromDevin Hassett, Morrison drained a three-pointer to put the Warriors up five. And then the senior hit a technical free throw with 7.8 seconds left to give Foxboro a 49-43 lead entering the fourth. Morrison also had five points in the fourth quarter, including an early three that put Foxboro up nine, an assist on Borde’s alley-layup at the midway point that kept Foxboro ahead by seven, and his game-clinching free throws. The first half was highlighted by mismatches on both sides of the court. Charles was Attleboro’s focus early on, scoring eight points and hauling in five rebounds in the first quarter. Douglas hit both of the Bombardiers’ three-pointers of the game in the opening frame, helping Big Blue take a 16-14 lead after one. While Charles gave Attleboro an advantage down low on the offensive end, Foxboro’s ability to spread the floor and shoot from distance gave the Warriors a leg up, especially in the second quarter. Foxboro hit five three-pointers in the second quarter to surge past Attleboro. Senior Bobby Harrison (career-high 15 points) was responsible for four of those triples, taking advantage of his matchup. With Charles defending the hoop in the paint, Harrison was left open and converted his chances. Rongione also hit a three in the period, helping the Warriors seize a 36-26 lead at the break. “Obviously [Charles] presents a huge mismatch for us when they are on offense because we don’t have anyone to match his size inside,” Gibbs said. “But we were also hoping we could do the same when we had the ball and use our perimeter to cause some mismatches for them. We talked to Bobby a lot about setting ball screens on the perimeter and pulling out to either shoot or drive. Foxboro finished 10-for-19 from three-point and 23-for-47 from the field overall. Foxboro boys basketball (8-3 Hockomock, 12-3 overall) begins its second go through of the Davenport schedule on Friday when it hosts Sharon at 6:30. Attleboro (6-5, 9-6) will try to bounce back when it travels to take on King Philip on Friday at 7:00. MILFORD, Mass. – It was a tale of two halves in a crossover matchup between Milford and Attleboro boys basketball. The Hawks started hot but it was the Bombardiers that finished strong. Big Blue overcame an 11-point deficit at halftime with a stellar third quarter and then finished the job in the second half, finishing the game off with an 8-0 run over the final two minutes to beat the Hawks, 59-51. The fourth quarter featured plenty of momentum swings but the Bombardiers put an exclamation point on the comeback with a couple of big plays in the final minutes. A putback from sophomore Qualeem Charles (10 points, 16 rebounds) and a pull up jumper just inside the free throw line from Bryant Ciccio (nine points) gave Attleboro an early five-point lead, but Milford chipped away with four straight points from junior Brendan White (17 points) to cut the deficit to one. Senior Nate Douglas drained a three to get the lead back to four and then hit one of two free throws to take a 50-45 lead. Milford’s Kayden Kelley (11 points, 15 rebounds) scored four straight points, taking feeds from White and Andrew Fraioli (eight points, five rebounds) on slips to the basket to again cut it down to one. Velazquez came up with another steal but was fouled, and hit one of two free throws to extend the lead to two. Fraioli answered immediately with a bucket while being fouled to tie the game, but couldn’t convert the free throw to take a lead. Tied 51-51, Attleboro put together its best stretch to win the game. Immediately following Fraioli’s tying bucket, Charles scored in traffic down low to regain the lead. Milford missed a three, Dom Victor (10 points, seven rebounds) hauled in the rebound and hit one of two free throws after being fouled. Despite missing the second free throw, Charles came across the paint to grab the board. Attleboro called timeout, and out of the break, hit a huge shot. Mason Houle and Douglas played catch as the shot clock ticked down. With just a few seconds remaining, Houle went in to Charles in the post, sucking the defense in. Charles returned the pass to Houle with just a couple of seconds on the shot clock, and the junior could have forced a contested three, but instead made one extra pass to Douglas in the corner. The senior calmly buried a three, giving Attleboro a 57-51 lead. Victor picked off a pass two plays later and went in along, finishing with a two-handed slam to put an exclamation point on the win. After being outrebounded 30-25 through three quarters, the Bombardiers had a 12-8 advantage in the final frame. The hosts came out red-hot in the opening quarter, hitting four of their first six attempts from behind the arc and shooting 50% from the field to build an early double-digit lead, and a 14-point advantage late in the quarter. A late three from Ciccio cut the deficit to 11 at the end of one, and the teams played an even second period. Milford led by as much as 15 (25-10) at the midway point of the period, but Attleboro outscored the Hawks 11-5 the rest of the way to keep the deficit the same at halftime as it was after one. Momentum swung in favor of the visitors in the third quarter. Attleboro sophomore Tim Callahan bookended the Bombardiers’ 19-6 surge in the period with a pair of three’s. An inbounds play on the baseline from Ciccio to Douglas resulted in a traditional three-point play. Trailing by 10, Douglas hit a pair of free throws, Kevin Velazquez drained a three then two plays later, stole a pass and went in for an easy layup. The teams traded a pair of misses before Victor hit two free throws to make it a one-point game. Fraioli converted a putback to extend the lead back to three but Victor drove strong to the basket for two, and Callahan drained another three off a feed from Charles to give Attleboro a 42-40 lead after three. Attleboro boys basketball (6-4 Hockomock, 9-4 overall) returns to action on Sunday to take on Bishop Feehan at 3:00. Milford (4-6, 6-7) will try to snap its current two-game skid on Tuesday when it travels to Mansfield. NORTH EASTON, Mass. – For two and a half quarters, Oliver Ames’ zone defense frustrated Attleboro’s offense and limited its high-power offense to just 27 points. But once the Bombardiers found their rhythm, due in part to an improved defensive showing, Attleboro was nearly unstoppable the rest of the way. 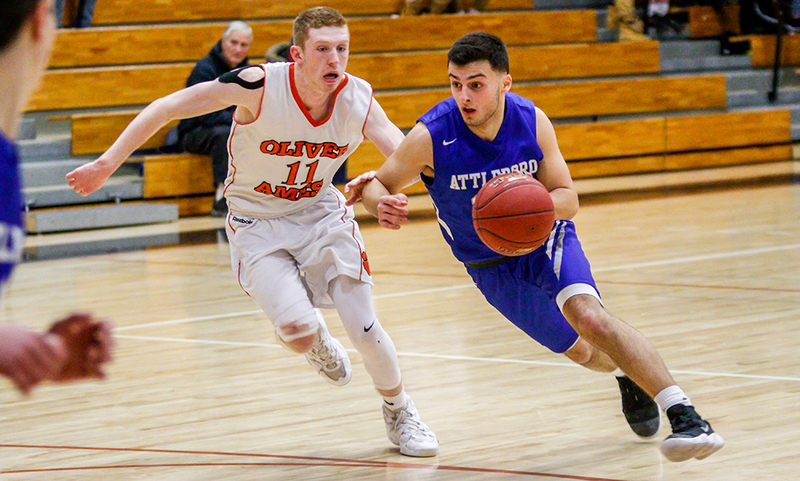 Attleboro outscored Oliver Ames 44-16 over the final 12 minutes of play, erasing a double-digit deficit and turning it into a double-digit win, 71-57. “I think it started with our defensive energy,” said Attleboro head coach Mark Houle. “Early on, they kind of had their way, they had some transition baskets early. In the second half, we did a better job of getting back and not letting up any easy baskets. It was a physical game. The Bombardiers were limited to 10 points in the first quarter and 11 points in the second. Meanwhile, Oliver Ames senior Jack Spillane (career-high 34 points) was getting almost everything he wanted. He scored 18 of the Tigers’ first 19 points and helped OA take a 31-21 lead at the break. Attleboro started hot in the third quarter, quickly getting the game within six but then went cold from outside. Big Blue missed from three-point range on six straight possessions, allowing Oliver Ames to get out in transition and convert, taking a 41-27 lead with 3:35 to go in the third quarter. 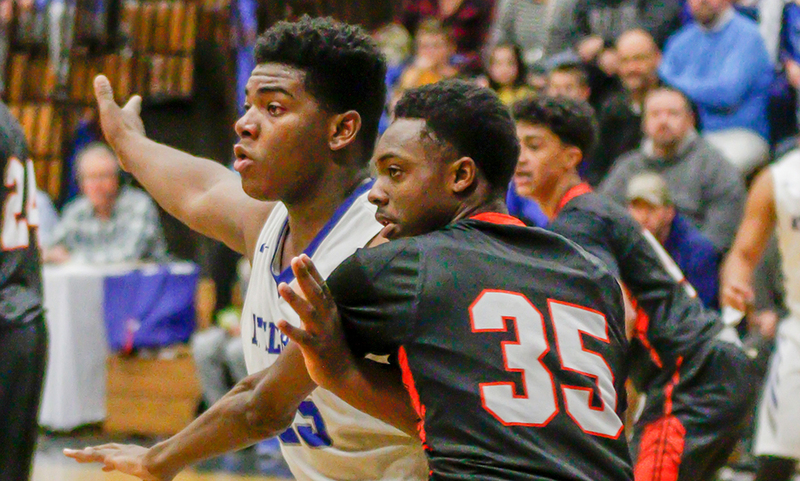 But on the ensuing possession, Attleboro finally got the ball in low as junior RMff (eight points, six assists) found sophomore Qualeem Charles (13 points, 15 rebounds, six blocks) who converted plus the harm. Charles’ traditional three-point play set the Attleboro offense in motion. Senior Nate Douglas (17 points, four rebounds) and sophomore Jason Weir (seven points, five rebounds) made back-to-back baskets, and then Weir came up with a putback off of a missed three to keep the momentum with Attleboro. After an Oliver Ames miss, sophomore Bryant Ciccio (career-high 18 points, five rebounds, five assists) went coast to coast, finishing with a nice up and under move high off the glass. Big Blue got another stop and this time fed Charles at the top of the key, sucking the defense in which allowed the sophomore to find Ciccio for a three-pointer. Douglas hit a pull up on the baseline shortly before the buzzer to cap a 16-2 run, tying the game 43-43 at the end of the third. 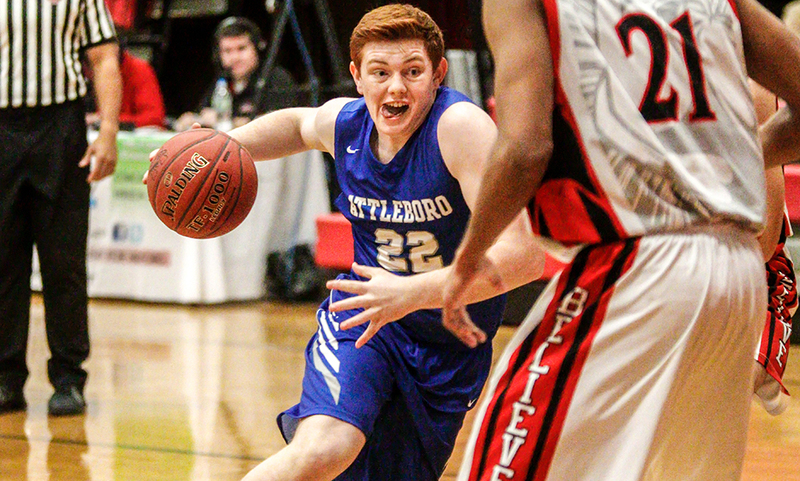 With the game in the balance over the final eight minutes, Attleboro finished the job. Spillane gave OA an early lead with a nice take to the basket, but Charles hauled in an offensive rebound and converted a putback to tie it. Charles scored on another offensive rebound only for OA’s Noah Fitzgerald (six points, three assists) to respond. Attleboro put the game away over the next two and a half minutes with a 14-2 run. Ciccio started the surge with a layup and then Houle picked off a cross-court pass and went in alone for a layup, plus the foul, for the traditional three-point play. Spillane brought OA within three with a pair of free throws but Douglas and Kevin Velazquez drained threes to extend the lead to 58-49. Charles finished the run with a free throw and yet another putback. After shooting 40% in the first half (50% from three-point range), the Tigers shot just 30% from the field in the second half and hit just one triple. “Part of it is offensively we did more [in the first half],” said OA head coach Don Byron about the first half effectiveness of the zone defense. “They’re taking the ball out of bounds, we’re setting our defense every time. Once it turns into a more free-flowing game, we’re at a disadvantage then. Attleboro boys basketball (4-2 Hockomock, 7-2 overall) is back in action on Tuesday in a key Kelley-Rex division showdown with first place Franklin; a battle of the division’s top scoring team against top defensive team. Oliver Ames (2-4, 4-5) hits the road to take on Taunton on the same day.